Ludwig Andreas Feuerbach studied in Heidelberg, Berlin and Erlangen. He completed his doctoral degree and habitation in philosophy at FAU in 1828 and became one of the most prominent supporters of materialism. His criticism of religion had a lasting effect on the Vormärz movement. He achieved sudden fame upon publication of his main work ‘Das Wesen des Christentums’ (the essence of Christianity). 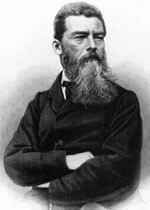 Feuerbach is regarded as the forerunner of Marxist philosophy.